R-8 End Mill Holder - 3/8"
Grizzly T25698 - R-8 End Mill Holder - 3/8"
Order individual End Mill holders to match your end mills. Sized to fit R-8 spindle tapers, 3/8" size. Takes 7/16"-20 drawbar. I bought this for my mill and for use in my Hamilton kitchen blender. Works like a charm. 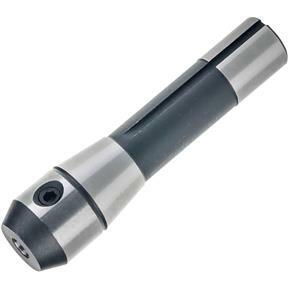 Very cost effective tool holders, allows you to have many bits set up so milling opps can be fast.